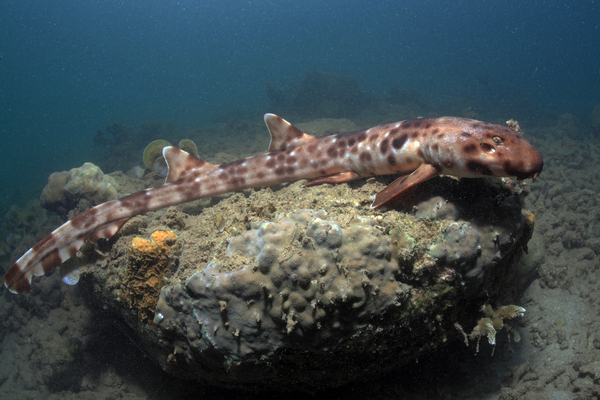 The Walking Shark or Hemiscyllium halmahera is a newly discovered species from Indonesia. Found off the remote eastern Indonesian island of Halmahera, this is the third species of walking shark in the past six years to be discovered in eastern Indonesia. These sharks will use their fins to “walk” across the ocean floor, searching for food in the darkness of night. This species is harmless to humans and can grow to about 30" (76cm) in length. You can check out some underwater footage of this shark walking in the video below. Little more is know about this new species. If you have any additional information about the Walking Shark please leave us a comment below.